If you have a fescue or other cool season lawn**, February is the time to give it some love in the form of fertilizer. Turfgrass experts at NC State University recommend applying 1 pound of nitrogen per 1000 square feet of lawn. If you have the results of a recent soil test, use those recommendations instead. To determine the amount of product required to apply 1 pound of nitrogen per thousand square feet, divide 100 by the first number on the fertilizer bag. A 16-4-8 fertilizer. Dividing 100 by 16 = 6.25 (100/16 = 6.25) pounds of product applied per thousand square feet to deliver 1 pound of nitrogen. 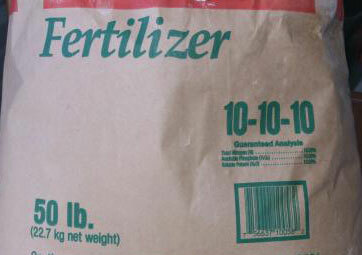 A 10-10-10 fertilizer. Dividing 100 by 10 = 10 (100/10 = 10) pounds of product to be applied per thousand square feet to deliver 1 pound of nitrogen. Cool season lawns should be fertilized on or around three holidays – Valentine’s Day, Labor Day, and Thanksgiving. Do not fertilize tall fescue after March 15. If your lawn has an abundance of annual weeds such as chickweed or henbit, an herbicide labeled for controlling these weeds in fescue can be applied as well. A weed and feed product can be used prior to March 15. After this date, herbicides without fertilizer should be used if weed control is needed. If you have a warm season lawn, do NOT fertilize this month. Fertilizing can begin once the lawn turns green. ** Not sure what “cool season” and “warm season” mean? Cool season grasses grow best in temperatures between 65 – 80 degrees F (spring and fall in NC). Examples of these are the fescues, perennial ryegrass, and bluegrass. Cool season lawns stay fairly green during our winters. Warm season grasses, like zoysiagrass, bermudagrass, centipedegrass, carpetgrass, and St. Augustine grass grow best in our summer temperatures between 75 – 90 degrees F. These grasses turn brown when dormant in winter.